Thanks to the generosity of our hosts: Cory and Chris Stephenson, the Mad Birders enjoyed a field trip to the old Pony Farm property on Pony Farm Road in Moretown. Varied habitat including fields, river corridor, meadows, wetlands and forests produced a wide array of species. 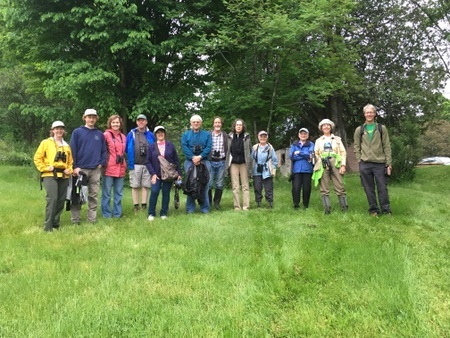 Participants practiced birding by ear skills and several sharp eyed birders spied a Savannah Sparrow on a ground nest, and after the adult flew off, we witnessed the tiny mouths of young nestlings still in the nest. The rains began as we concluded our walk and what’s more fun than birding in the rain anyway?